Cory You (December 28, 2003) - With 2003 pretty much being the greatest Muppet merchandise year in ages, it was only fitting that we'd be seeing some new Muppet video games for the holiday season. 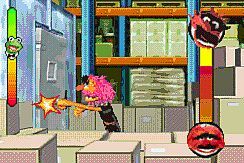 There have really only been a couple of exceptional Muppet video games in the last decade; most notably Muppets Inside (PC, 1996), Muppet RaceMania (PS, 2000) and Muppet Pinball Mayhem (GBA, 2002). 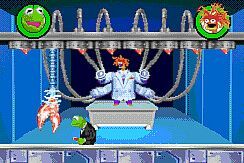 Order Spy Muppets: License to Croak for the Game Boy Advance. Oddly enough, we haven't seen too much in the way of Muppet action/adventure games, which is a shame as the wacky madcap nature of the Muppets lends itself perfectly to the genre. At first glance, Spy Muppets looks exactly like On With The Show, which was a collection of simple pseudo polygonal Muppet mini-games. And that's pretty much what this is, except with more of a story that ties it all together. But unlike that other Game Boy Advance game, there's at least some sort of reasoning for it all. And that's what I admired about what TDK and Vicarious Visions were trying to do here. The premise of the game is actually pretty good, a sendoff spoof of all the James Bond 007 films. The game contains a lot of satirical references to those films which work well here (like Dr. Nose and Piggy Galore). You play of course as Kermit (Agent Frog), who has just been briefed by Sam the Eagle (AKA Agent Patrio) of a shadowy worldwide crime syndicate called S.H.E.L.L. (Secret Hidden Evil League of Lobsters) plotting to take over the world. Soon it's off to the High Tech Global See-All-Kinds-Of-Stuff Tracking Room deep within M.U.P.P.E.T. headquarters to select which villain to tackle first. 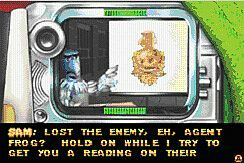 I loved the Sam Eagle loading interface that you see before each level begins, as well as his comical projector screen debriefings. A lot of the game's humor and chemistry comes off in these scenes. Of course you can't have a high tech gadget plot going without Beaker and Bunsen Honeydew. And here they are, Agents B&B who show up from time to time with not much usefulness at all (though I think that's the inside joke). Sadly, Beaker's trademarked 'hapless lab assistant' antics are nowhere to be found here. And off you go. After you have selected what Muppet villain to go after, you are whisked away on a chase. Whether it be chasing after penguins and chickens on a ski slope with Fozzie (AKA Agent "Triple F"), using a speedboat to catch up to lobsters, or driving after Piggy's cousins on the open road, it's pretty much your standard doge and jump setup. Next up is the "throw stuff" level which consists of throwing eggs at chickens, throwing eggplants at pigs, or swimming through an underground mechanical claw cave. On each level you are given an agent buddy, which can sometimes be a help or a hindrance. When your ski mobile breaks down on the slope level, Fozzie lets you use him to ride on the rest of the way down. But later Fozzie ends up getting in the way of the chicken assault. Rizzo and Animal (AKA Agent Argh) are your other assigned agent buddies. In between each level is a series of CGI rendered cut scenes with some surprisingly funny moments, be it banter between the Muppet agents, super villains, or the post mayhem insanity. The graphics of the game are quite good, especially on the Pepe levels (something about Pepe in a mechanical suit will likely made you laugh). A lot of the Muppets look out of character rendered in polygons during the cut scenes, but in the game sequences everyone looks and animates smoothly. The controls are a bit on the wackky side, given there isn't much to do. Again, it's a glorified series of mini-games, which can be forgiven given the premise. 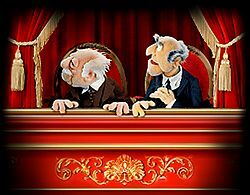 Music has always been a part of the Muppets, though the spy riffs and ported over sounds from On With The Show barely seem to fit. I think it's the humor that is the best feature of the game. Other than that the game is so basic, and on a elementary level that it's hard to really call this an out in out adventure. My biggest complaint is that the game is way too short. I mean really short. Including the end boss stage and hidden 'death trap' levels, there's only 15 stages. This might be fine for the kiddies, but the more experienced gamers will be left wanting more. 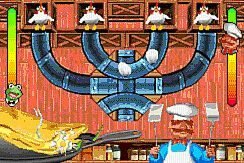 The odd thing is, you actually have to lose at least once at each of the boss stages to see some of the better cut scenes and play the bonus levels (like the Swedish Chef Omelet of Doom, Animal door bashing and Rizzo’s rat trap). It's no surprise there isn't much to this game, but it does have a lot going for it. My favorite levels would have to be the Pepe boss stage (think Spiderman's Dr. Octopuss meets David Byrne from Talking Head's big suit), Swedish Chef level, as well as the Statler and Waldorf mechanical robot boss battle (which reminded me of something out of the Metal Slug series). The other neat little surprises in the game are the cameos and references a lot of fans will appreciate. There's a whole level with nothing but lobsters. I guess they gave up on trying to pester the Swedish Chef in the kitchen and joined a global crime organization. Penguins, chickens, and rats also abound. References to Doc Hopper and other Muppet stuff was also a nice touch. This is the third Muppet title released for the Game Boy Advance and while I got a lot more use out of Muppet Pinball Mayhem, I have to say that overall I found this more amusing and lively. Don't buy this expecting some kind of epic adventure, but more a kind of goofball romp through the wackiness you know and love.